Exploring Mughal culture & It's Heritage, History, Foodie delights, Nature, Festivals, Historical Monuments and Religious places. Remembrable Photo Essays of The Taj Mahal Tourism in India. Coming for a Taj Mahal Tour ? Everyone knows Taj Mahal, one of 7 wonders of the world but many people have no clue about the city where it resides. 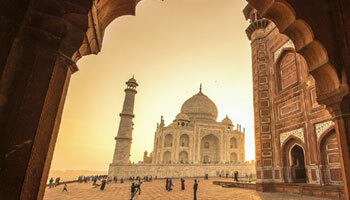 Taj Mahal tour is one of the most popular tour in India. Mughals were one of the most dynamic dynasties in the medieval world. Agra is home to the finest examples of Mughal architecture in India. The visit to the Taj mahal, you have to experience it to believe it, picture do not do justice to it. Taj Mahal is a symbol of Love. All the tourists find it simply stunning! Same day Taj Mahal Tour is a lifetime experience to remember forever as the historical monuments with in and around the city leave the travelers spellbound. Although it's possible to see "Agra Same day-trip from Delhi" the Taj alone deserves so much more - a fleeting visit would miss the different moods of Taj Mahal, as the light changes from sunrise to sunset. I recommend the Taj Mahal to any romantically inclined person such as myself, but if you have a loving partner, bring her/him too. The best time for Taj Mahal tour is October to March. A little about myself. Hii ! My name is Ashish Sharma. I am a resident of this historical city Agra. This website was started as a hobby to help tourists visiting Agra, India. I myself have seen all the monuments in Agra many times, still i can see Taj Mahal again and again (there is some magic in Taj, i think). I regularly get chance whenever any of our relative or friend comes to Agra. I updates this website frequently to provide up to date tourism information related to visiting Agra. This website is not associated with any touring company, hotel or commercial enterprise. How to reach Agra for a Taj Mahal tour by plane, train or by road. Places to visit when touring Agra. Actual history of Agra and all the monuments. Information and reviews about different expensive and best cheap budget hotels in Agra. Information about different Agra best restaurants and eateries in Agra. Shopping tips in Agra, where to shop and for what. Little overview about other tourist destinations in India like Goa, Rajasthan and Kerala. The Biz Agra Web Site is Divided up into a Number of Sections to Help You Find What You are Looking For..
Agra, the city of Taj in India was established in 1475 by Badal Singh. Agra came into its own when the Lodhi Kings choose this place beside the River Yamuna to be their capital city. Read for more about history of historical city Agra. We give the best possible route to Agra. You can reach Agra by road or Train as there is no direct flight. You can take a rented car from delhi or can reach by quality trains like Rajdhani Express or Taj Express. Accommodations Agra city has some finest quality hotels of India. Hotels like Oberoi Amarvillas and JayPee Palace are world class hotels of India. Other quality hotels are Mughal Shereton, Holiday Inn, Trident, Clark Shiraz, Trident Hilton, Etc. Their are also many Best hotels, Luxury hotels, Budget hotels in Agra. Agra have many quality restaurants and is a heaven for north Indian food lovers. Agra also have international fast food joints like Pizza Hut, Mcdonald's, Domino's, Pizza Corner, Cafe Coffee Day, etc. Agra is not only a famous tourist destination but is a shoppers paradise too.There are plenty of shopping areas and shopping malls where one can buy the specialities of the place like replica of taj Mahal, shoes, bags, rugs and carpets. Same day Trip Delhi to Agra Taj Mahal, Agra Fort Include Fatehpur Sikri from Delhi. Golden Triangle Tour Package is also very popular which consists of Delhi, Agra and Jaipur. For Taj Mahal day tour Sunscreen, loose comfortable cotton clothing, a wide-brimmed hat & sunglasses are essential equipment while traveling in summer. While traveling in winter-woolen clothing, warm clothing is essentialat nighttime. Come & see the Agra Video Tour and you'll see free clips of all of the amazing views of Agra, picture of Taj Mahal, Home of Mughal - Red Fort, A rickshaw ride in Agra, Travel by road from Delhi to Agra, Fatehpur Sikri - A Ghost city, View of Taj Mahal from Hotel Room and an typical Agra marriage with Indian cultute & tradition. The Agra blog will keep you up to date with the new and updated features at bizagra.com. so you don't have to search the whole site for new pages and regular updates about Taj Mahal India tour and travel stories, reviews. If you want to feel royality and cultural heritage of India, come & visit Rajasthan tour. Jaipur - The pink city is the capital of Rajasthan. The places of top tourist interest are Jaipur, Jodhpur, Jaiselmer, Udaipur, Bharatpur, Ajmer etc. Coming for Honeymoon trip in India ? The best choice is Goa. Goa Have world class beaches and all the facilities required for tourists. thus Goa is best honeymoon destinations in India. A very good night life is also there in Goa. Kerala enjoys unique geographical features that have made it one of the most sought after tourist destinations in Asia. An equable climate. A long shoreline with serene beaches. Tranquil stretches of emerald backwaters. Here i will tell about Best India Travel Books which are very informative and helpful for a first time traveler to India. Great Agra Travel stories, contributed by visitors around the world & reviews about hotels & monuments in Agra. There are some Visa & Passport requirements for travelling to India. All foreign nationals, including children, require a visa to enter India. Please do not finalize your travel arrangements to India before ascertaining visa requirements.